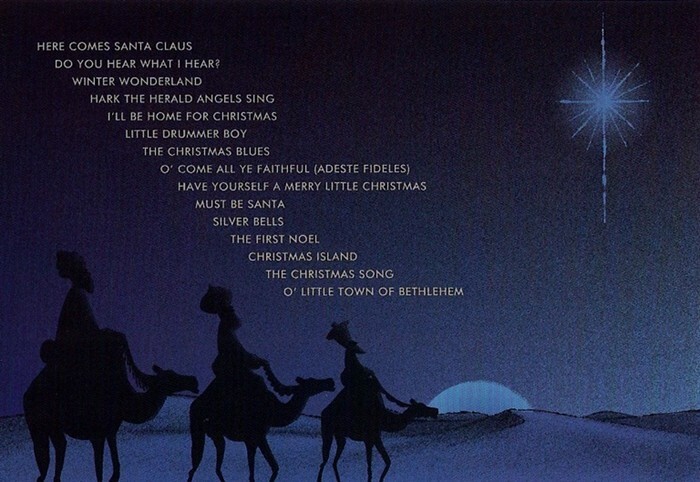 "O' LITTLE TOWN OF BETHLEHEM" is one of four traditional hymns recorded by Bob Dylan in the spring of 2009 for the album "Christmas In The Heart", released in October 2009, albeit without giving any credit to the actual writers or composers of those hymns, which are all four only listed in the minute print of the credits as "Traditional, arranged by Bob Dylan". Nevertheless those four hymns are sung by Bob Dylan with a sincerity which conveys his genuine understanding of the true meaning of Christmas and the biblical truth it is based upon. In those days a decree went out from Caesar Augustus that all the world should be registered. This was the first registration when Quirinius was governor of Syria. And all went to be registered, each to his own town. And Joseph also went up from Galilee, from the town of Nazareth, to Judea, to the city of David, which is called Bethlehem, because he was of the house and lineage of David, to be registered with Mary, his betrothed, who was with child. And while they were there, the time came for her to give birth. And she gave birth to her firstborn son and wrapped him in swaddling cloths and laid him in a manger, because there was no place for them in the inn. And in the same region there were shepherds out in the field, keeping watch over their flock by night. And an angel of the Lord appeared to them, and the glory of the Lord shone around them, and they were filled with fear. And the angel said to them, "Fear not, for behold, I bring you good news of great joy that will be for all the people. For unto you is born this day in the city of David a Savior, who is Christ the Lord. And this will be a sign for you: you will find a baby wrapped in swaddling cloths and lying in a manger." And suddenly there was with the angel a multitude of the heavenly host praising God and saying, "Glory to God in the highest, and on earth peace among those with whom he is pleased!" When the angels went away from them into heaven, the shepherds said to one another, "Let us go over to Bethlehem and see this thing that has happened, which the Lord has made known to us." And they went with haste and found Mary and Joseph, and the baby lying in a manger. And when they saw it, they made known the saying that had been told them concerning this child. And all who heard it wondered at what the shepherds told them. But Mary treasured up all these things, pondering them in her heart. And the shepherds returned, glorifying and praising God for all they had heard and seen, as it had been told them. Now after Jesus was born in Bethlehem of Judea in the days of Herod the king, behold, wise men from the east came to Jerusalem, saying, "Where is he who has been born king of the Jews? For we saw his star when it rose and have come to worship him." When Herod the king heard this, he was troubled, and all Jerusalem with him; and assembling all the chief priests and scribes of the people, he inquired of them where the Christ was to be born. They told him, "In Bethlehem of Judea, for so it is written by the prophet: "'And you, O Bethlehem, in the land of Judah, are by no means least among the rulers of Judah; for from you shall come a ruler who will shepherd my people Israel.'" Then Herod summoned the wise men secretly and ascertained from them what time the star had appeared. And he sent them to Bethlehem, saying, "Go and search diligently for the child, and when you have found him, bring me word, that I too may come and worship him." After listening to the king, they went on their way. And behold, the star that they had seen when it rose went before them until it came to rest over the place where the child was. When they saw the star, they rejoiced exceedingly with great joy. And going into the house they saw the child with Mary his mother, and they fell down and worshiped him. Then, opening their treasures, they offered him gifts, gold and frankincense and myrrh. And being warned in a dream not to return to Herod, they departed to their own country by another way. See for yourself "if the Bible is right".